These are just a small sampling of the tailored fixtures we provide … quickly, and economically … drawing upon our vast experience, extensive onsite manufacturing capabilities, and huge inventory of stock solutions. If you have a custom or custom-from-stock fixture project, contact us to discuss your budget and needs. A Technical Explanation of Exactly What We Can Do. Computer-controlled, infinite length, three-dimensional bending, forming and straightening on single- and multi-slide, multi-feed machines working from 11 gauge (0.120″) to 3/8″ (0.375″) diameter wire and lengths up to 55″. Individualized automated workflows for high volume or short run needs. Automatic blanking, multi-slide forming machines and high-speed, computer-controlled, servo-fed presses ranging from 45 to 80 tons capable of the most intricate part designs. 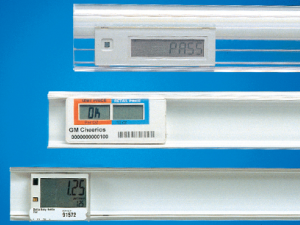 Material working thickness range from light strip to 11 gauge (0.120″) and up to 6″ wide. Plastic co-extruders capable of extruding up to four dissimilar materials into one profile with downstream assembly, cutting, punching and packing equipment. Low and high carbon steel, alloy steel, stainless steel, and non-ferrous metals in strip and wire form shapes. Extrudable plastics (including specialized cooler and refrigerator formulations compatible to 15 degree Fahrenheit) and injection molding plastics from inexpensive commodity resins to engineering-grade polymers. Uniform, high-quality powder coating, sophisticated “crackle” and “marbleized” powder coating finishes and painting. The working of materials with galvanized and other pre-plated finishes, or outsourcing of completed parts or assemblies for post-manufacturing plating or finishing. Automated assembly, automated resistance welding, hydraulic presses for punching, blanking, forming, and assembly, cold heading, air benders, spot welding (5 to 150KVA transformers), straighten and cut machines and ultrasonic welding of plastics. State-of-the-art injection molding presses with capacities from fractional to 43 ounces and clamping force from 25 to 400 tons employing a full range of modern thermoplastic materials from economical commodity resins to engineering-grade polymers. Manufacture and automated heat bending and die cutting of thin plastic shelf talkers of any size and shape, including screen printing and full color lithographic printing. Design and engineering, prototyping, metalworking die and plastic extrusion die making, customized packing, on-site computer-tracked warehousing, expedited order handling and shipping, and support for just-in-time manufacturing. For a quote or consultation with a Trion industrial sales specialist call toll-free 1-800-444-4665, fax us at 1-570-823-4080, or submit an RFP. 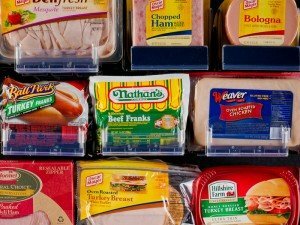 Modifying the front of Trion® WonderBar® EWT ®Trays to accommodate packages of round bologna created a solution that is also adept at merchandising square, loaf and other shape deli prepacks. 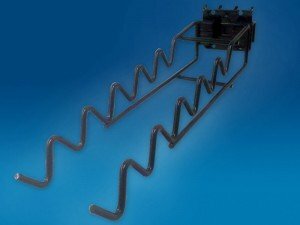 Featuring an oversize Backplate to distribute heavy loads, this hybrid hook design is equally at home on Pegboard, Slatwall and Bar Merchandiser.